There’s no doubt in anybody’s mind at this point that Kindle eBooks are here to stay, right? I mean, I’m pretty sure we’ve made that point before, so why dwell on it? Well, think for a minute how many people have traditionally done most of their reading in things besides books. Obviously magazines and newspapers are an impressively large market to extend the concept into. Amazon(NASDAQ:AMZN), similar to B&N and others, has been making a push to get a hold on this new market. We’ve recently seen a rather extensive update to the Kindle Magazine marketplace in the form of Kindle for Android compatibility updates. 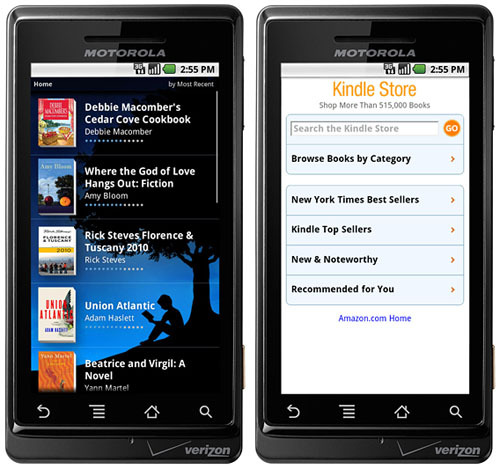 The Kindle for Android app, in addition to and much like the Kindle device itself , now allows its users to subscribe to over a hundred different periodicals and newspapers through the Amazon site. The basic format is nice, and pretty well suited to the devices most likely to be displaying these publications. It is primarily text-based, of course, which works out really well given the small amount of screen real estate you’re dealing with. Images such as those you’d see on the existing Kindle publications are still included, but now they’re in color. As is not at all surprising, magazines and color get along well. Subscriptions come automatically delivered to your device, and you can even sign up for more material through the built-in store right in the app itself. The implementation isn’t disappointing in the slightest in spite of the transition to a small screen by what has long been a fairly large-format type of publication. This update could be seen, in many ways, as a response to the recently released Nook Color eReader. While many reports (and I’ll admit that my own experience supports this and might add slightly to the bias here) indicate that the screen is anywhere from mediocre to horrible for lengthy book reading, the full color screen and quick refresh rate make it perfect for quick reads like magazines, recipe books, and kids books. Since Amazon doesn’t have a similar product on the market right now, they can at least allow for development of their marketplace by capitalizing on the abilities of the many Android based devices that have sprung up left and right since the dawn of the Tablet PC marketplace. Not a bad idea to be having. It’s fairly widely perceived to be inevitable that Amazon will eventually come up with a full color eReader display for future Kindle releases, so this will also hopefully go some way toward having a fleshed-out marketplace ready for the new capabilities. I don’t mean to deride the capabilities of the Kindle device in the slightest, it’s the best for what it does by a fair margin in my opinion, but there’s just something lacking in the magazine presentation on the existing eInk screen. If you’re an Android user, give it a try. Amazon offers a fair selection of magazines to grab in free trial to see if this is something you’d be interested in. Chances are good that you won’t be disappointed.